Voici le site de la pétition demandant “le retrait” de la circulaire du 31 mai. “(…) La France gagne à recevoir des étudiants étrangers. Les étudiants étrangers ne sont pas une menace pour la France, ils sont une chance. Les universités le savent très bien : la France doit recevoir plus d’étudiants étrangers. C’est aux Etats-Unis, au Royaume-Uni, au Canada, en Australie et maintenant même en Chine, que les étudiants étrangers apportent leur créativité, leur savoir-faire, leur énergie, leurs découvertes et leurs dépôts de brevets. Je suis bien placé à l’École d’Économie de Toulouse pour savoir à quel point les étudiants étrangers, et au delà les collègues étrangers, enrichissent notre vie professionnelle quotidienne et notre communauté. With my colleagues Philippe Alby and Jean-Jacques Dethier, we worked extensively on the impact of electricity outages, which plague a large part of the developing world (keep in mind for example that the average number of cutoffs from the public electricity grid per year that firms face can be as high as 132 times in South Asia and 61 in Africa), on firms’ behavior and performances. This paper shows that outages push many firms to invest in costly generators, while those unable to do so because of their small size or of credit constraints simply don’t exist! As a result, industrial development is held back. Y’en a marre est né à cause d’une des nombreuses coupures d’électricité que connaissent les Dakarois. Le 16 janvier, le journaliste Cheikh Fadel Barro reçoit ses amis d’enfance. Il dénonce dans les colonnes de La Gazette les scandales liés à la statue de la Renaissance, qui a coûté 26 millions d’euros à l’Etat – et dont Aboulaye Wade s’est déclaré seul détenteur des droits d’auteur –, il révèle aussi l’existence de terrains achetés en liquide par le même président. Ses amis, les rappeurs du groupe Keur Gui, sont originaires comme lui de Kaolack, au centre du pays. Du temps du régime d’Abou Diouf, Thiat et Kilifeu avaient été emprisonnés pour avoir critiqué la gestion de leur ville. Le 16 janvier, ils sont donc chez Barro, et depuis quelques heures une coupure d’électricité a plongé Dakar dans le noir. More on the emergence of a New Type of Senegalese (NTS) in this Slate Africa article! Usually, it’s common for a development economist to associate lack of transparency, biased communication on facts or even data manipulation with autocratic governments. For several decades, we knew little about many developing countries basic figures such as income, poverty, or access to public services such as education and health. With few exceptions, it is fair to say that immense progress has been made. Household surveys of different kinds are now pervasive, and more specialized surveys on many critical aspects of society are very often available online. This has been in part the result of a coordinated effort of governments and international institutions, in a context in which democracy has been on the rise: in the last 30 years, the number of democracies almost doubled, while that of autocracies plummeted. There is a strong belief among practitioners that transparency and data availability is a crucial ingredient of a successful development strategy, for at least two basic reasons. First, defining adequate policies requires accurate facts; and second, information is the key to democratic control by citizens. “les indicateurs tirés des évaluations nationales des trois paliers du socle commun ne sont pas fiables pour des raisons de méthode”. And recall the tension a few months ago, when the direction of INSEE, French National Institute of Statistics and Economic Studies publicly disallowed the interior minister, who had grossly and repeatedly misquoted a study on the link between immigration and educational failures. So is this French government traveling the road of transparency in the wrong direction? To go further, Claude Thélot, who headed for 8 years the statistical office at the education ministry and has been conseiller-maître at the French Cour des Comptes (the Comptroller General office) discusses these and other related aspects in this interview. The gravity equation in international trade is one of the most robust empirical finding in economics: bilateral trade between two countries is proportional to their respective sizes, measured by their GDP, and inversely proportional to the geographic distance between them. While the role of economic size is well understood, the role played by distance remains a mystery. In this paper, I propose the first explanation for the gravity equation in international trade. This explanation is based on the emergence of a stable international network of importers and exporters. Firms can only export into markets in which they have a contact. They acquire contacts by gradually meeting the contacts of their contacts. I show that if, as observed empirically, (i) the distribution of the number of foreign countries accessed by exporters is fat tailed, (ii) there is a large turnover in exports, with firms often going in and out of individual foreign markets, and (iii) geographic distance hinders the initial acquisition of contacts in an arbitrary way, then trade is proportional to country size, and inversely proportional to distance. Data on firm level, sectoral, and aggregate trade support further predictions of the model. True, the data seem at first sight to fit quite well the necessary theoretical conditions, namely the fact that “the distribution of firm level total exports is close to Zipf’s law, and (…) the average (squared) distance of a firm’s exports is a power function of this firm’s number of contacts”. However, further empirical evidence will clearly be needed to give more bite to this line of explanation. As discussed during the seminar, I’ll be very interested in seeing whether some historical “natural experiments”, which could be thought of as additional constraints on the way firms expand their contacts, such as the long term isolation of some countries from the world’s markets (think of Apartheid South Africa, or communist countries being the iron curtain), or temporary disruptions (e.g., the famous closing of the Suez canal from 1967 to 1975, which is arguably an exogenous shock on distance between a number of country pairs) have affected the dynamics of trade in ways that would conform to the model’s predictions. Here is the book, currently available in Hardback. The launch event in Paris was an interesting one, especially because it was the opportunity for academics like me to learn about the way the world has changed for multinational companies such as Siemens or Thales (remember their previous name anyone?) 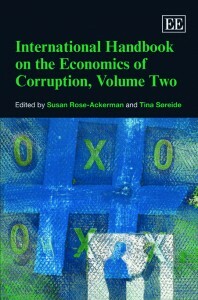 eversince it is not fashionable anymore to pay large bribes in developing countries. In particular, the Thales representative stressed that “active” corruption is no longer acceptable, but that unfortunately they may still face “passive” corruption, i.e., be subject to harassement and other illegal requests, which are hard to turn down. What is not entirely clear to me is the real difference between these two categories. Does it mean that before, executives would have no second thoughts when paying bribes if that would enhance their business opportunities, while now they are quite unhappy when they face such demands? Or did bribe requests really change nature? Besides, it was also mentioned that while outright monetary bribery may have decreased overall, this probably goes hand in hand with significant changes in the nature of the compensations being used. For example, it may now be safer to ensure a job in the business venture, or a share of local business, to relatives and friends of important local contacts than to pay direct bribes. So, has corruption really declined in the wake of international conventions and campaigns since the 1990s? It would be great to have a micro-data based answer to this question. Note that so far, the standard country-level macro-data available tends to indicate that “on average the world has not significantly improved in the quality of governance“, in the words of Daniel Kaufmann.